Beijing / Peking Duck | Get Your Grub On! Ballsy Xiao Long Bao in Da’an. 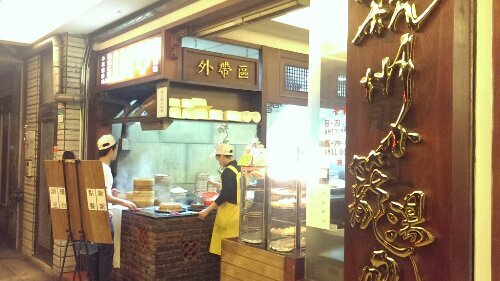 My food fanatic friend A. recommended this place to me that he found during his last Taiwan trip and tonight a colleague helped me hunt it down just across the street from the Chiang Kai-Shek Memorial Hall in Da’an. ‘Hang Zhou’s’ is quite a rustic place with low tables and tiny chairs and still had many customers enjoying their dinner here, despite the late hour we arrived. 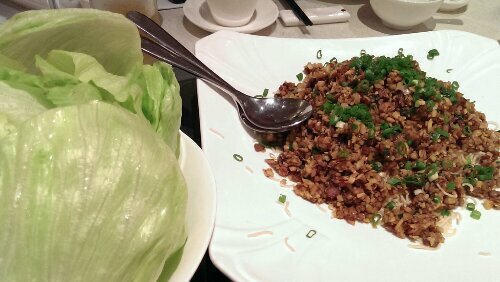 We started up with the signature dish, the ‘Xiao Long Bao‘ (小籠湯包). These were gigantic huge dumplings but tasted quite nice; the dough was a bit thick though and I had better soups as well but overall pretty good and dirt cheap too and I especially liked the big help-yourself-bucket of finely chopped ginger which I loaded up on heavily. The second basket were the ‘Shrimp Shiaomai‘ (蝦仁燒賣) and these were even bigger, maybe even too big and again this fusion of soupy xiao long bao topped with a shrimp which suits me much better than the shao mai dim sum versions I had before. 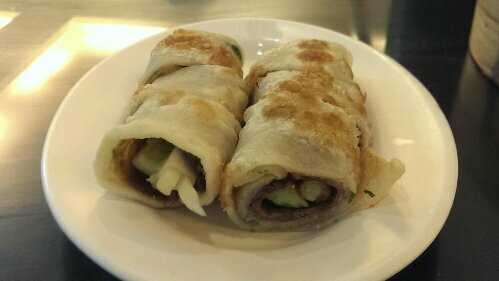 As little contrast to all those enormous dumplings we ordered the ‘Marinated Beef Rolls‘ (大餅卷牛肉) which reminded me of a creative adaption of peking duck. They were delicious, slightly dry tenderloin rolled in crispy pancakes, together with some crunchy cucumbers and onions and glazed with a sweetish plum sauce. Actually it was exactly like peking duck, just with beef, ‘Peking Beef‘ so to speak? Even though I found it quite ballsy of these guys to call the website of their shop “thebestxiaolongbao.com“, I still kinda liked the place – unpretentious, a bit dirty and service along the bare minimum but none in an overly bothering way and most importantly the food was tasty and cheap as well. Thanks for the recommendation dude. It was my ramen buddy’s belated birthday party plus a welcome dinner for the parents of a friend and our duck specialists booked us a table at the Paragon branch of the ‘Imperial Treasure Super Peking Duck’. What an awesome name. We obviously ordered the signature ‘Beijing Roasted Duck‘ and two at that. As it has it’s show effect they carved the ducks directly at our table with a precision that must come from doing this over and over again. The duck was dished up in three different and fantastic ways. Firstly we ate the most crispy pieces of the skin, no meat, just dipped in sugar. The skin was caramelized and melted in my mouth, fat at its’ very best. The second version were the more meaty bits which we rolled into transparently thin pancakes with crunchy sticks of scallion and cucumber all covered with a wonderful thick and sweet hoisin sauce that beautifully complimented the savory duck. And the meat itself, especially the breast bits, was moist and soft with this light game flavor. Even that not as delicate and fancy as the first two, the third way of the duck was one of the surprises of the dinner. I expected another average rice or noodle dish using the leftover duck chunks for flavor but here they minced the duck finely and mixed it together with some sort of grain, mushrooms, fresh herbs and spices. We wrapped the tasty mixture into big salad leaves and dug in. How lovely scraps can be, simple and amazing. This was probably the best ‘Peking Duck‘ I had outside China and after having tried this I can’t imagine why anyone would call this anything different but “Super”. The place itself, still a faceless Chinese restaurant but with a much warmer light and feel than usual. The staff was very friendly and food and drinks came up pretty fast. This might have just become a new place to bring my visitors to. Quak quak!